Tinnitus, a sensation of hearing ringing or roaring noises from within in the ear, is no fun at all. It bothers the person a lot and can even interfere with activities like answering your phone or even crossing the street. It can bother you a lot once it happens. And it doesn’t only happen to a few. Many people suffer from tinnitus without knowing what it is and how to minimize it. It is actually a symptom of a disease and not the disease itself. It can be perceived differently by different people. Sometimes, it sounds more like a buzz, a hiss, a roar or even a click. And that happens even without an external trigger. And since it’s a symptom, you can only relieve it once you identify its cause and treat it. There are several causes of tinnitus. Constant listening to loud music, repeated exposure to noise, stress, trauma, medical conditions, reactions to medication, or even changes in the inner ear cells may all contribute to tinnitus. The constant ringing in the ears ranges from tolerable (though annoying) to excruciatingly painful, depending on the cause. People who work around heavy equipment and machinery that generate a high level of noise are more likely to develop ringing in the ears. These include construction workers, industrial engineers, and those who work with firearms such as policemen, among others. People who listen to loud music for extended periods of time (usually using headphones from portable music devices – and annoying EVERYONE on the train!) are also prone to tinnitus. Ear wax naturally occurs in the ear canal and lines the inner ear, trapping dirt and bacteria. The ear canal needs to be cleaned regularly otherwise the earwax accumulates and becomes difficult to wash away naturally. This build-up causes the eardrum to become irritated, which is a known ear ringing cause that leads to ringing in the ears. When the bones in the middle ear stiffen (a condition known as otosclerosis), hearing gets affected and causes tinnitus. Otosclerosis is caused by abnormal bone growth, which is usually a genetic condition. This means that if a family member has otosclerosis, it’s likely that other members of the family are predisposed to it. 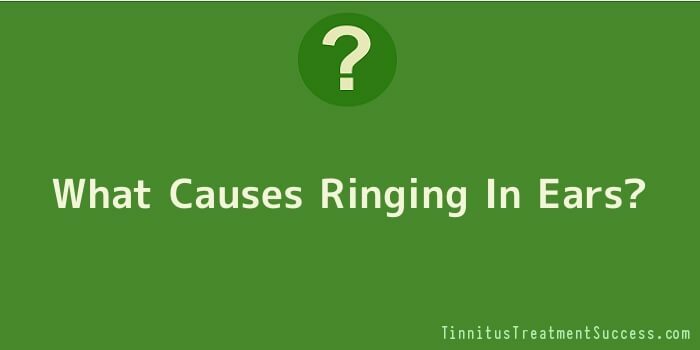 There are other causes of ringing in the ears, which are not as common as the previous four. These involve problems with the temporomandibular joint, which is found on each side of your head—just in front of your ears—where the lower jawbone meets your skull. Since these are neurological disorders, they can have effects on the inner ear, the hearing nerves, and hearing-related brain functions. In these types of cases, the tinnitus usually only affects one ear. This condition only causes ringing in one ear; it is a benign tumour which develops on the cranial nerve that runs from the brain to the inner ear. The tumour affects balance and hearing, a condition known as vestibular schwannoma. Some rare cases of ringing in the ears may be due to blood vessel disorders. This type of tinnitus is known as pulsatile tinnitus. Medications which may cause ringing in the ears Certain medications may contribute to tinnitus or make it worse. Common culprits are antibiotics, diuretics, certain cancer medications, antipyretic/analgesic/ant malarial medications, and large doses of aspirin. Higher doses of a particular medication may cause mild to severe tinnitus, depending on the individual. The causes of tinnitus that have been mentioned above are just some of the known conditions and predispositions. If you are a tinnitus sufferer, determining what is causing your tinnitus is the first step towards relief and ear-ringing freedom! Some types of tinnitus are not dangerous, but by being able to identify what causes ringing in the ears for you personally, will mean that you will know if it’s just constant exposure to loud noise, head injury etc or if it’s the symptom of a more serious disease. Being able to identify what causes ringing in the ears is very important because knowing this, you will then be able to treat and relieve tinnitus more effectively by using the right natural tinnitus treatment.